This mornings striper fishing trip was a success in terms of the number of fish to the boat and the cool air present well down the river. The icing on the cake cam in the last few minutes. 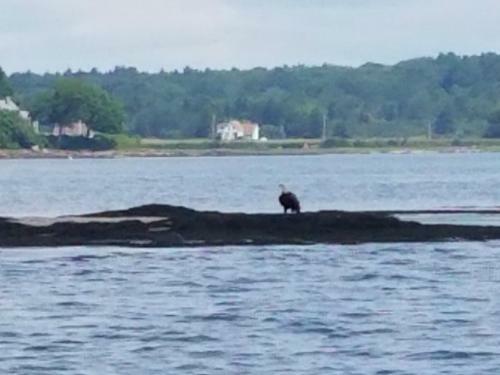 As I was pulling away from one of the last fishing spots I noticed an eagle land on one of the nearby ledges. Always interesting to see one standing and not perched in a tree. I motored closer as a second eagle landing on the ledge. The second one was not as patient as the first and flew off as I was fumbling with my phone to get the shot. Something interesting on this mornings trip that is for sure.